When you start Minecraft, the Forge code prepares a couple of things and then starts searching for mods. It looks through the java code in the mods folder until it finds a class which is preceded by the @Mod annotation. If you have designed your mod properly, this will be your "Base Mod" class. Forge finds the @Mod, reads a couple of pieces of information about the mod (a unique "ID" name, the human-readable name, and the version), and now knows that the base class for your mod is TestFrameworkMod. (NB all the code in this tutorial can be found here). The general name for this technique is Reflection. Reflection: the ability of a computer program to examine and modify the structure and behavior of an object at runtime. Reflection allows inspection of classes, interfaces, fields and methods at runtime without knowing the names of the interfaces, fields, methods at compile time. Forge uses this quite a bit to integrate with your mod code without knowing in advance what you've called your classes and how they're structured. Now that Forge has found your Base Mod Class definition, it also needs to know where the instance of your class is. To do this, it searches a bit further until it finds @Mod.Instance. It now knows that instance is the instance of your Base Mod Class, which it uses later on to communicate with your class. In order to understand the next part, I first need to explain a couple of concepts about Server and Client. Minecraft is designed from the ground up to be a multiplayer game. For this reason, it is split into two parts - "server" and "client". the "client" interacts with each user - reading their keyboard and mouse, and drawing things on your computer screen. Every player will have their own "client". the "server" maintains the world and everything in it. It talks to all of the clients to find out what each user is doing, updates the world accordingly, then sends the updated information back to all the clients. There is only one server. But then they figured out that it was pretty user-unfriendly for you to have to run the DedicatedServer if you wanted to play LAN multiplayer with your buddies, so they added an "Integrated Server" into the Client (the "open to LAN" feature) and made what I like to call the "CombinedClient". (For some reason everyone else just calls it the "Client", which is a bit confusing I think). Dedicated Server (which has only server-side code). They use the "SidedProxy" in order to do this. Forge hunts through your Base Mod until it finds @SidedProxy. It then chooses the appropriate Class from the options you have provided, creates an instance of it, and puts it into the field immediately after the @SidedProxy annotation. If the mod is installed in a normal Minecraft client, the proxy variable will be set to your class CombinedClientProxy (which inherits from CommonProxy). If the mod is installed in a dedicated server, the proxy variable will be set to your class DedicatedServerProxy (which also inherits from CommonProxy). // normal Minecraft client or a dedicated server. Code in the CombinedClientProxy, which only gets called on the normal Minecraft client. Code in the DedicatedServerProxy, which only gets called on a dedicated server. Code in the CommonProxy base class, which is called regardless of where the mod is installed. Please note - this has NOTHING TO DO with the difference between client-side and server-side. That is something totally different. A comment about Server vs Client objects - because of the way that Java loads classes, your server-side classes should not have any mention of Client-side-only vanilla objects whatsoever. It doesn't matter whether the code is ever executed- simply having a Client-side-only definition somewhere in your class is often enough to cause a crash. 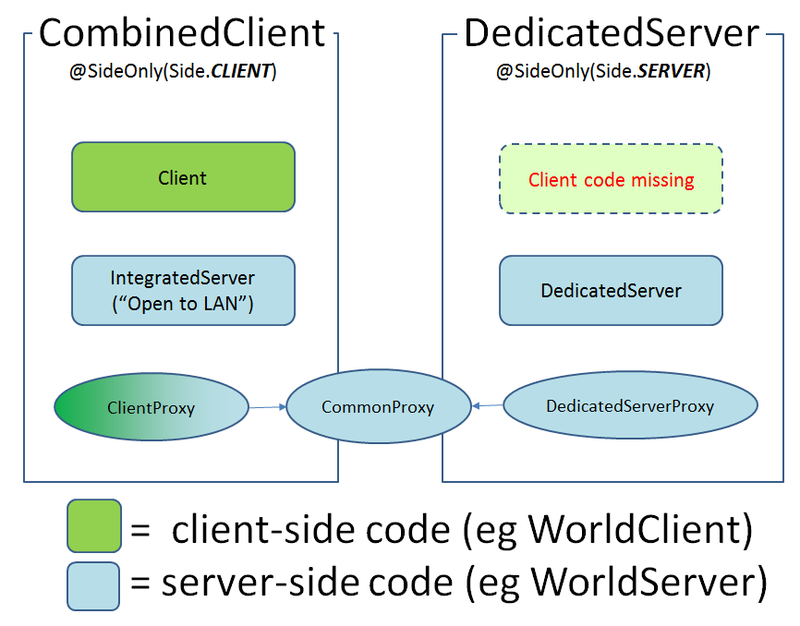 Use a dedicated client-side-only class instead, or alternatively a method in your proxy classes. During startup, Forge will call your Mod several times to let you add new blocks, items, read configuration files, and otherwise integrate itself into the game by registering your Classes in the appropriate spots. PreInitialization - "Run before anything else. Read your config, create blocks, items, etc, and register them with the GameRegistry." Initialization - "Do your mod setup. Build whatever data structures you care about. Register recipes." PostInitialization - "Handle interaction with other mods, complete your setup based on this. PreInitialization is peformed for all the mods, followed by Initialization for all mods, followed by PostInitialization for all mods. Initialising the mods in phases is particularly useful when there might be interactions between multiple mods - for example if one mod adds an extra type of wood (during PreInit), and your mod adds a recipe which uses that wood (during Init). When Forge wants to tell your mod that it's time to run your PreInitialization code, it reads through your mod's code until it finds @EventHandler in front of a method, then checks the parameter definition to see if it matches the FMLPreInitializationEvent Class. If so, it calls the method. The PreInitialization, Initialization, and PostInitialization events will often need to do different things depending on whether your mod is in a CombinedClient or a DedicatedServer. For this reason I suggest that your event handlers should just immediately call a method in the CommonProxy, see below. Thank you for doing all of this! You're welcome :-) Actually it's good fun for me to figure out how it all works, and I find that trying to explain it helps me understand it better myself too. It's great to see some informative Forge documentation! Cleared a lot up for me. This is great information about server and client. Well explained about dedicated proxies and all. I am using Microleves Dedicated Proxies. It works fine for me and will understand what you want to explain in this post. Download Minecraft APK free Game on android and PC windows. For Knowing more about Minecraft PE gmaes please go that link and now the updates about Minecraft Pocket Edition gmaes.